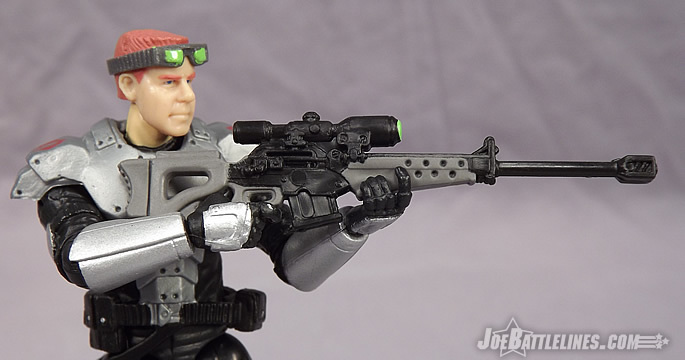 Review: Figure Subscription Service Cobra Sniper Black Out! It’s another Figure Subscription Service review– this team featuring Cobra Sniper Black Out!!! Black Out debuted in 2003 as part of the Spy Troops series of G.I. Joe figures and immediately grabbed the attention of fans because of his compelling file card story. He was the dark counterpart to the G.I. Joe team’s own Barrel Roll– the “bad brother” who went over the forces of Cobra and was implicated in the disappearance of his own sister. It’s the kind of plotting that would make for an interesting movie and another shining example of the importance of file cards in the G.I. Joe line. Thanks to the G.I. Joe Collector’s Club, Black Out was made available to those who signed up for the first Figure Subscription Service as the mystery 13th figure and shipped at the same time as his brother Barrel Roll! Does the Black Out figure measure up to the standards of the Figure Subscription Service? Is he up to the task of carrying out his feud with Barrel Roll in collections everywhere? Check out the review in the Collector’s Club Review Index and find out one Joe fan’s opinion! It’s been forever since I’ve written a review for JBL. However, that hasn’t stopped me from still reading reviews of Joe products both old and new. As such, I’ve been LOVING the “Many Faces Of…” series that Zed has been posting over at ZedsJoeSite.com. Sure, I may not always agree with his ratings but I still enjoy seeing such a comprehensive look at the many versions of a single character that Hasbro has inundated fans and collectors since the relaunch of G.I. Joe back in 2000. It seemed a no-brainer that both Snake Eyes and Storm Shadow would be featured given the fact that they seem to have a new version released every third Thursday of the month. However, I was extremely pleased to see that Zed takes on Cobra’s premiere saboteur in his latest installment! 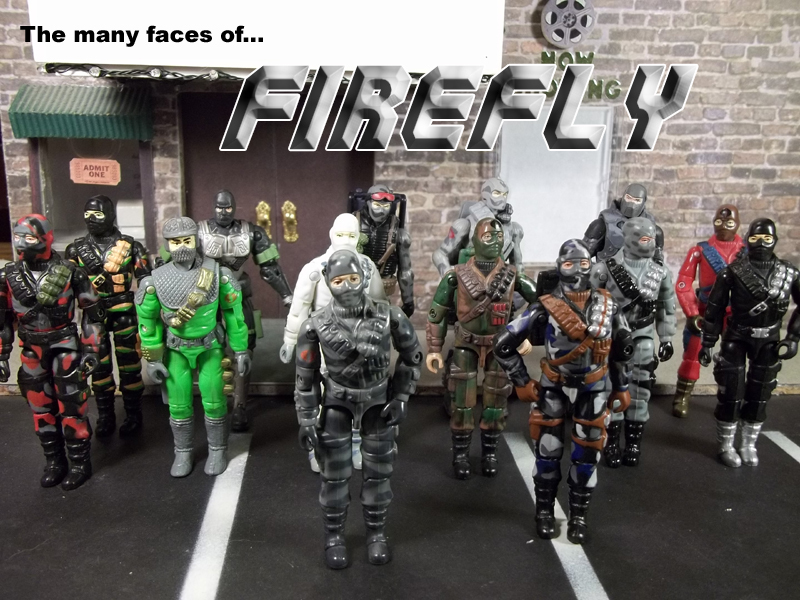 Check out The Many Faces of Firefly over at Zed’s site! If you missed this year’s Collector’s Convention, you missed out on the opportunity to pick up a copy “in hand.” However, James has come through with the promised information on how to order you very own copy and have it delivered to your door! Hi gang, the moment is finally here! I’m not going to set up a fancy lil e-mail, just type out the bare basics so please visit www.rahcguide.com to catch up on all the fan reviews of the R.A.H.C. Guide on your favorite message boards!! With that being said, the cost of the book is $40 with $5 shipping and handling. Payment can be paypalled via kuukuuson@hotmail.com. You may send the payment as a gift but if you choose not to, please allow paypal to adjust your payment to accomodate paypal fees. Orders will be held until total payment is made and you will be notified of any additional costs. When you send your paypal payment, please include your address and any specific information for your order in the paypal notification as that is how I will be keeping track of your order. I will copy and paste the address so please make sure it’s correct. I will gladly entertain international orders so please contact me here (rahc.guide@gmail.com) so I can look into how much shipping is to your location. I am very excited to provide this book for you and can’t wait to hear your response! Please remember that not only is this guide self published in limited quantities, it is being processed and shipped by myself and might take some time. Thank you in advance for your patience and understanding! Coming soon – RAHC Guide covering 1997 – 2007! Long-time JBL member James Kavanaugh dropped this very juicy tidbit in my inbox on Monday. Now, one of my favorite eras of G.I. Joe will have the guidebook it deserves! I’ve made no bones about the fact that, while the “no-ring” Joes have some great sculpting I still prefer my Joes with that antiquated little construction element. When James first showed me proof pages for this book several years ago, I was blown away by the sheer amount of detail that he was putting into it. It’s a true labor of love from one of THE most passionate fans that I know and it’s an honor and a privilege to be able to post the announcement for this project. However, don’t take my word for it– look at the gallery of images below which offer a preview of the Joe-goodness that will be contained within. Seriously– it’s going to be THAT good!